I can’t wait until SSD drives are commonplace in the computer market. They have so many benefits that traditional platter drives can’t hold a candle to. When it comes to notebooks, they’ve really got the older drives licked because they don’t have any moving parts to malfunction when you drop it. We’re seeing new drives springing up more often now and the prices (while still high) are falling. What’s interesting about the latest drives from Lexar is that that they give you the option for external use. 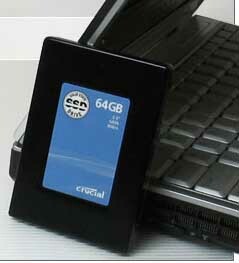 The new Crucial SSD drives from Lexar fit the 2.5-inch form-factor. However, unlike most SSD drives we tend to see, you won’t have to crack the case on your PC to install this one. The 32GB and 64GB drives were designed for notebooks with internal SATA ports, however, if you’re just looking to supplement your current drive, you can get their external kit and settle for a USB connection. Honestly, I think the drives would be put to better use on the inside of your notebook. The 1ms latency would be put to better use when loading up Windows (or your OS of choice) and running everyday tasks, rather than just transferring files. No word yet on pricing or availability.